If you are looking for a place with good fishing, swimming, boating, and a great location, look no further than the Papa Don`s Place! If you are looking for a place with good fishing, opportunities for swimming and boating, and a great location, look no further than the Papa Don's Place! This charming home with its open concept and gorgeous lake views is perfect for your family. The cozy living room, dining area, and kitchen are open to each other, allowing you to enjoy family and conversation freely. One bedroom (Queen bed) and full bath are located on the main level and the other two bedrooms (1 Queen and 1 Double bed) are located on the lower level. The lower level also includes the laundry area and rec area with a foosball table and a ping pong table. The wooded lot offers seclusion and privacy for your vacation enjoyment, and the gentle slope allows for easy access to the dock area. Enjoy some relaxation in the hammock or swing at the waterfront. 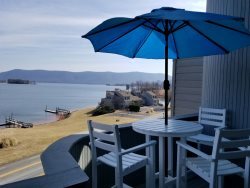 Contact us today to reserve the Papa Don's Place to start your Smith Mountain Lake Family Vacation memories! !